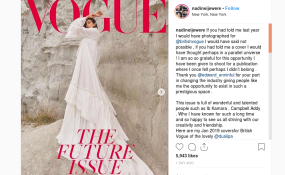 Nigerian-Jamaican Nadine Ijewere photographs cover of Vogue. Nigerian-Jamaican photographer, Nadine Ijewere has become the first black female photographer to shoot a cover for Vogue Magazine. The London-based portrait and fashion photographer took a shot of global pop star Dua Lipa for the 2019 Edition of British Vogue. If you had told me last year I would have photographed for @britishvogue I would have said not possible , if you had told me a cover I would have thought perhaps in a parallel universe ! I am so so grateful for this opportunity I have been given to shoot for a publication where I once felt perhaps I didn't belong . Thank you @edward_enninful for your part in changing the industry giving people like me the opportunity to exist in such a prestigious space . This issue is full of wonderful and talented people such as Ib Kamara , Campbell Addy . Who I have known for such a long time and so happy to see us all striving with our creativity and friendship. Here are my Jan 2019 coversfor British Vogue of the lovely @dualipa Styling @kphelan123 Nails @amaquashie Hair @jawaraw ❤️❤️ mua @mirandajoyce Set @davidjameswhite_ Thank you to a wonderful team , thanks to all the assistants video , production and vogue teams that worked on this also you have made my 'vogue ' experience so lovely . And also a huge Thank you @jimmymoff for your continuous support with @redhooklabs And working with new artists ! An excited Ijewere announced the feat on her Instagram page @nadineijewere writing; "If you had told me last year I would have photographed for British Vogue, I would have said not possible. "If you had told me a cover, I would have thought perhaps in a parallel universe. "I am so grateful for this opportunity I have been given to shoot for a publication where I once felt perhaps I did not measure up," Ijewere said. Ijewere, who studied photography at the London College of Fashion, is known for using her photography to champion diversity and celebrate all kinds of beauty. Her highly styled emotive images often explore ideas of beauty, diversity and representation informed by her own Nigerian/Jamaican diaspora heritage. NAN reports that in September, Ijewere photographed Rihanna for her famous Allure cover. So far, her clients include Selfridges, Nike, i-D, Dazed, Liberty, Tate Britain and Stella McCartney.